VANCOUVER, BC--(Marketwired - March 24, 2014) - Meryllion Resources Corporation ("Meryllion" or the "Company") (TSX VENTURE: MYR) is pleased to announce that its program of reconnaissance mapping has led to the identification of another mineralized porphyry system on the Cerro Amarillo Cu-Mo-Au property in west central Argentina. 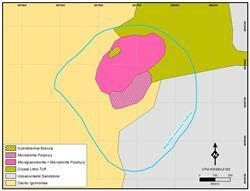 The newly mapped system, known as the Vaca de Cobre prospect, lies some three km east-southeast of the Cerro Apero prospect along the eastern margin of the property (Figure 1). The persistent presence of chalcopyrite throughout the potassic alteration zone at Vaca de Cobre indicates it hosts a better-developed mineralization event than any of the other prospects presently recognized on the property. The Vaca de Cobre prospect (Figure 2) was originally identified by Meryllion during its regional reconnaissance program as an area of yellow alteration visible in low-resolution satellite imagery. Recently, Meryllion georeferenced an aeromagnetic image from a helicopter survey flown over the area some years ago by Xstrata/MIM which indicated a strong magnetic anomaly slightly offset from the colour anomaly. As well, Meryllion superimposed new, high-resolution imagery captured by DigitalGlobe's WorldView-2 satellite, and found that a dark-grey colour anomaly is coincident with the magnetic anomaly, and is approximately 600 m in diameter and corresponds to an area of magnetite+chlorite alteration. In some outcrops, this magnetite+chlorite alteration appears to be a retrograde overprint of earlier secondary biotite (potassic) alteration. The centre of the magnetic anomaly occurs near the southern end of this outcropping potassic alteration zone, which suggests that this zone may be significantly larger at shallow depth. The original yellow colour anomaly corresponds to an area of albite+pyrite alteration that surrounds the northern side of the system, and appears to overprint the magnetite+chlorite alteration at the boundary between the two zones. Within the magnetite-chlorite alteration zone is a complex of porphyry intrusives which outcrop over an area 450 m in diameter. The intrusives range from quartz-diorite to granodiorite in composition, and have similar mineralogy and textures to the other mineralized intrusive centres within the property; however, these bodies have a higher-proportion of free quartz, suggesting they are more fractionated than those found elsewhere. A hydrothermal breccia body with magnetite infill was mapped within the southeast section of this intrusive complex, and is approximately 50 m diameter in outcrop; the full extent is obscured by scree. Mineralization at Vaca de Cobre was largely seen to be associated with quartz-magnetite stockworks, which were observed throughout the chlorite-magnetite alteration zone and appear to be most abundant (up to 10% rock volume) in a hornblende+biotite+quartz diorite porphyry in the northern-half of the intrusive complex. Veins in the chlorite+magnetite altered volcanics surrounding the intrusives are more abundant but thinner and dominated by magnetite. Mineralization occurs principally as chalcopyrite replacing magnetite in the stockwork veins, breccia and alteration of the potassic zone, particularly where the potassic alteration is partially overprinted by chlorite or albite+pyrite assemblages. Chalcopyrite was also observed as disseminated grains in the quartz-rich intrusives, which may represent replacement of primary magnetite or infilling of minute miarolitic cavities. Many of the chalcopyrite grains observed in outcrop are coated with a thin layer of chalcocite, suggesting supergene enrichment processes have been active. 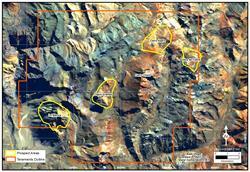 Copper carbonate minerals (malachite and azurite) were also observed in a few outcrops. In summary, the Vaca de Cobre prospect contains a classical "porphyry copper" style intrusive complex with a mineralized core of potassic alteration and a halo of albite+pyrite alteration. The system is exposed at a level where the potassic alteration is partially overprinted by propylitic and albite+pyrite alteration, which is typically an ideal level within the system for precipitation of chalcopyrite. The potassic core of the system is somewhat larger than that at Cerro Apero, and the historical magnetic data indicates it may be increase in size with depth. The system does not appear to have a shell of phyllic-altered breccia, nor the potential for skarns seen at Cerro Apero as it lacks receptive country rock. While the scale of Vaca de Cobre is somewhat smaller than the Cajon Grande system, the persistent presence of chalcopyrite throughout the potassic alteration zone indicates a better developed mineralization event than any of the other prospects presently recognized on the property. 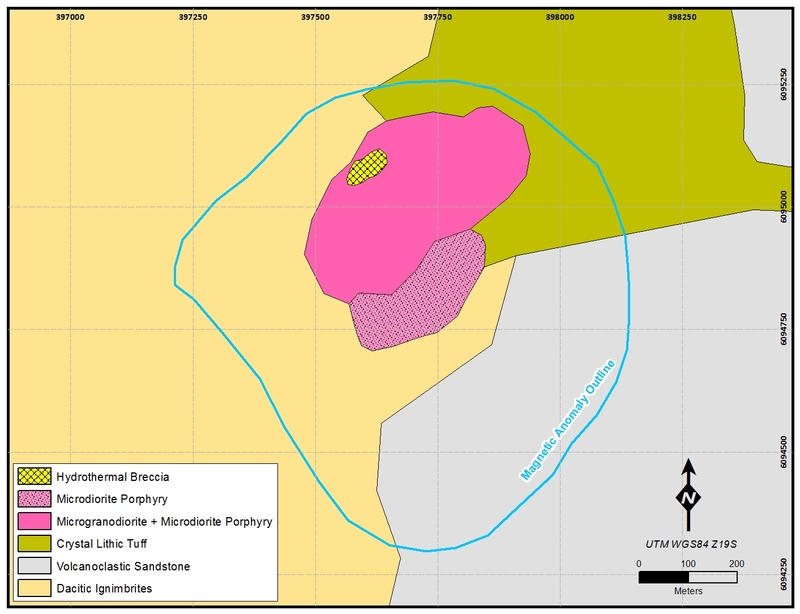 "Our exploration efforts have indicated that Cerro Amarillo is a cluster of mineralized porphyry systems along a northeast-trending corridor", commented Meryllion's CEO Terry Krepiakevich, "This is not unlike what has been found at the Vicuña and Alumbrera camps in Argentina or the Escondida, Collohuasi and Chuquicamata properties in Chile. Furthermore, each system at Cerro Amarillo has a sufficiently large scale footprint indicating large-tonnage potential for the property." Meryllion's program at Cerro Amarillo comprises detailed geological mapping, geochemical sampling, and geophysical surveying together with property-wide prospecting. The exploration is being supervised by Willem Fuchter, PhD PGeo, CEO of Meryllion's subsidiary in Argentina. Dr. Fuchter is a Member of the Association of Professional Geoscientists of Ontario ("APGO"), and is a qualified person in accordance with National Instrument 43-101 Standards of Disclosure for Mineral Projects. He has approved the data disclosed in this news release. This press release contains forward-looking statements. All statements, other than statements of historical fact, constitute " forward-looking statements " and include any information that addresses activities, events or developments that the Company believes, expects or anticipates will or may occur in the future including the Company's strategy, plans or future financial or operating performance and other statements that express management's expectations or estimates of future performance. Figure 1. 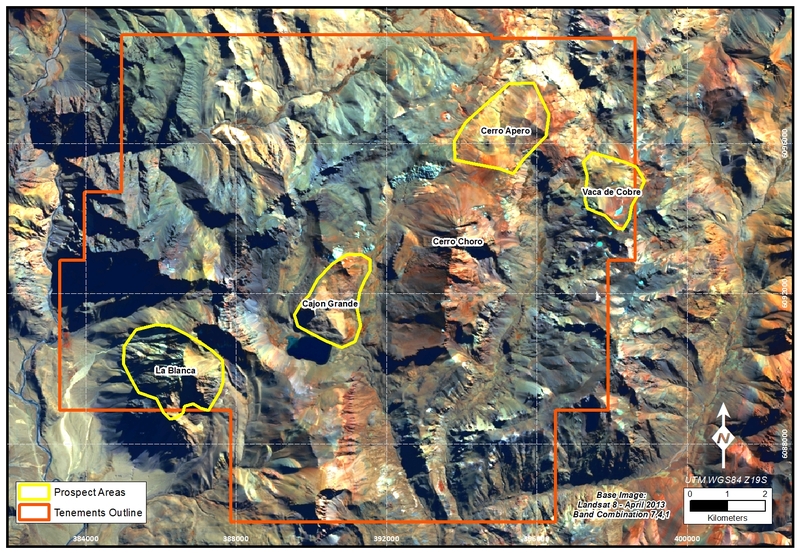 The Cerro Amarillo property in Argentina showing the location of the Vaca de Cobre, Cerro Apero, Cajon Grande, and La Blanca prospects. Figure 2. Geological map of the Vaca de Cobre prospect on the Cerro Amarillo property in Argentina.